Cenexi gained its fourth European manufacturing site in 2017 with the acquisition of a world-class steriles facility from a Big Pharma company. Hérouville-Saint-Clair is located near the northern coast of France, just 230 km from Paris, and significantly increases Cenexi’s capacity for production of sterile syringes and ampoules. The facility also adds further non sterile liquid dose manufacturing and packaging capacity. With over a decade serving the global pharmaceutical market, and now four manufacturing sites with excellent regulatory records, Cenexi is a contract development and manufacturing organization (CDMO) that has rapidly built a strong reputation for its sterile fill-finish expertise, innovation and quality. Cenexi is sharply focused on surpassing customer expectations with flexible capacity, deep technical and regulatory expertise, formulation development, and exceptional customer service surrounding capability for pre-filled syringes, ampoules and vials. Our Cenexi Services division offers exceptional regulatory, formulation and analytical expertise, with a team that will manage your entire project from pre-formulation and formulation to pilot scale and commercial production – for all dosage forms. Cenexi’s four state-of-the-art manufacturing facilities are located in France and Belgium, and all sites have been successfully inspected and approved by the major regulatory bodies, including the FDA (USA), EMA (EU), ANSM (France), PMDA (Japan), and KFDA (South Korea). Cenexi is a global provider of contract development and manufacturing services. We offer large, mid-size and small pharmaceutical and biotechnology customers a comprehensive breadth of drug product outsourcing services with a long facility record of compliance and reliable delivery, and deep scientific expertise within our team. 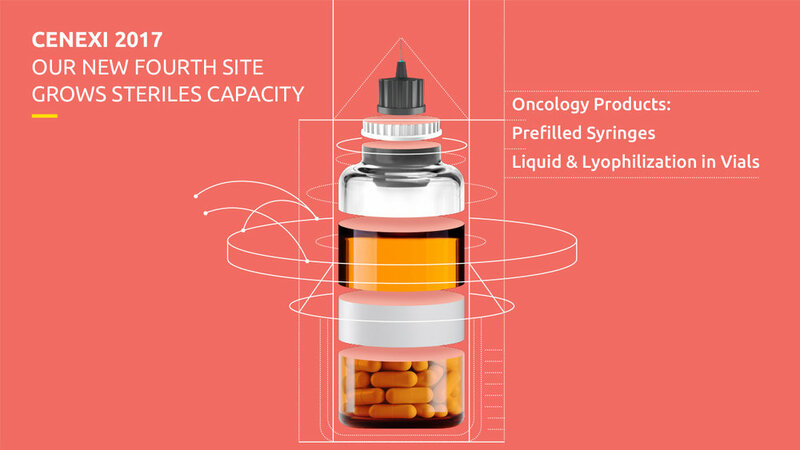 We are a leader in sterile product manufacturing, specializing in prefilled syringes, vials and ampoules, including high containment capacity for highly potent compounds. Our dosage form capabilities also extend to tablets and capsules, liquid oral dose, suppositories and creams. With our flexible, customer-oriented approach, we look to build relationships capable of serving many of your drug product manufacturing projects. Strong regulatory, technical and scientific expertise helps us to establish a clear understanding of project objectives and provide exceptional management of complex product portfolios or technical transfers for customers worldwide. If you are interested in finding out more about a CDMO that offers world-class, flexible capacity for multiple dosage forms and is motivated to work with you at every stage of development and manufacturing, contact Cenexi. We look forward to discussing how we can serve you. Interested in joining Cenexi Group?